+Nintendo Stocks fall to its lowest point in over a month. What does this mean? 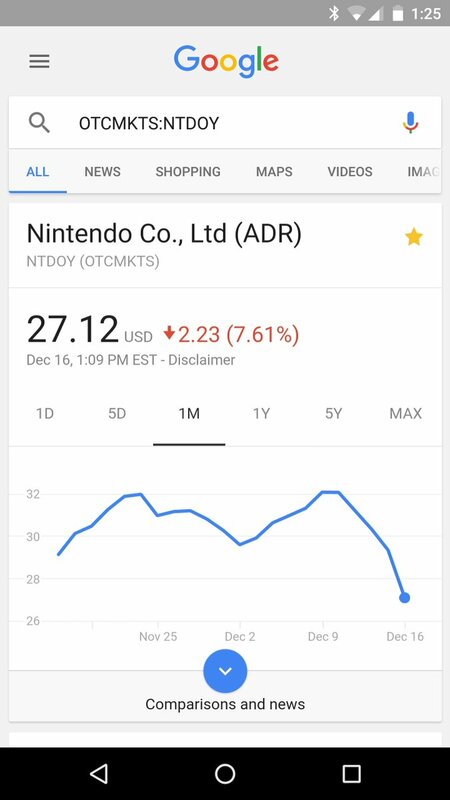 So, Nintendo Stocks seem to be tanking over the last week in a half, what does this mean for the "Big N"? Honestly nothing, I wouldn't read to closely into the stocks especially at this point into the year. The stocks are probably just fluctuating because the lackluster updates to Pokemon Go, and the so called leaks of the Nintendo Switch's specs. If funny how all negative press about Pokemon Go seems to affect Nintendo stocks, when they only own a small portion of the game. The spec leaks state that the Nintendo Switch will be rocking a last generation Nvidia APU that won't be about to match the power of the PS4. It also states that the "Tablet" will only have a max resolution of 720p meaning most games will be probably be running below HD resolution for top performance. We'll see what happens when Nintendo holds its "Nintendo Switch" Press and Media event early next year.